As we have discussed many times, Arizona is one of the top states for school choice. It is not uncommon for one family to have each of their children in a different learning environment depending on their needs. This is truly an opportunity for parents and educators to be pro-choice, for the children. One of the most popular charter school chains in the Phoenix area is Great Hearts Academies. They have several campuses throughout the valley. Students are often on waiting lists as many parents choose Great Hearts after hours of research and school visits. Everything appeared to be going swimmingly for this education community…….and then the public school culture came visiting. Recently there was a brush-up over the bathrooms. Remember, these parents knew the standards when they chose Great Hearts, nobody at Great Hearts is forcing any child to attend their schools. Since the bathroom controversy, Robert Chevaleau has been turning heads as he attempts to change Great Hearts into a transgender petri dish that violates current Arizona law. He handles the media just right–whine and complain to draw sympathy. Let’s set the table: During last year’s Red for Ed financial demands, many in the media and public education decided to pounce on charter schools to divert focus off the many inept government-run schools. Of course all charter schools should be transparent and produce results. Too bad these same officials and media members don’t ask as much of the local public schools they claim to love. At the same time, one of the most inexperienced candidates was elected as Arizona Superintendent of Public Instruction, riding the Red for Ed wave and its data base that was collected while the public school teachers were illegally striking for six days in the Spring instead of teaching, for the children. Once Kathy Hoffman was elected, she made it clear her office would be a welcome mat for anything LGBTQ, no matter what the laws in Arizona are. She also showed complete disregard for families who enroll their children in school to learn, focus on facts not politics, and develop critical thinking skills. Robert Chevaleau has been a thorn in the side of Great Hearts Academies of late. He is now running the Arizona Trans Youth and Parent Organization, so he needs to raise money. Some media attention should help. And of course, a lawsuit against Great Hearts is just what the trans doctor ordered. The hate group ACLU loves to pounce on these anti-science opportunities. It’s ironic a group of lawyers doesn’t understand some fundamental tenants of our Founding Fathers. We are a group of states in which the federal government was given very little power. Because of that the states should have the power and as citizens Americans can choose to live in a state that best reflects their own values and needs. No more, not with the unlawful federal Department of Education and organizations like ACLU which demand we all live under the same mandates they create. The American Civil Liberties Union is well-funded, so most individuals and school districts retreat like a limping dog rather than fight the ACLU bullies. More on that shortly. And what about this recent tweet? Why the ganging up on Arizonans? Weren’t we told during Red for Ed the teachers are just so busy? How is staff supposed to cater to GLSEN’s whims? 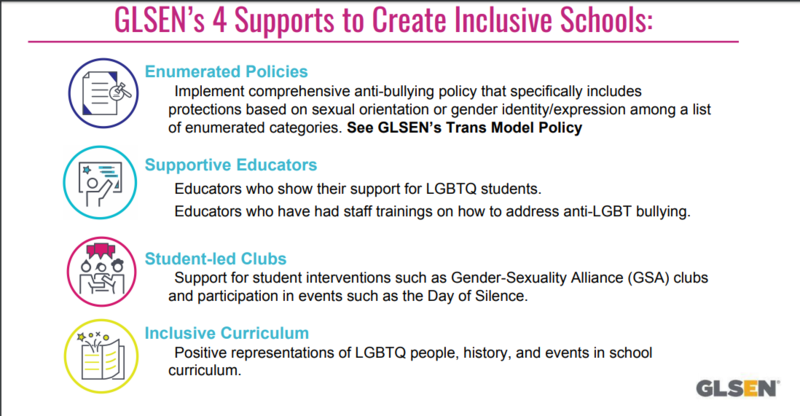 Where are the schools supposed to get the money for GLSEN’s demands? After all, administrators and teachers told us the buildings are barely being held together for lack of funds. Now let’s look at the real money and the real reason LGBTQ is now all the rage. 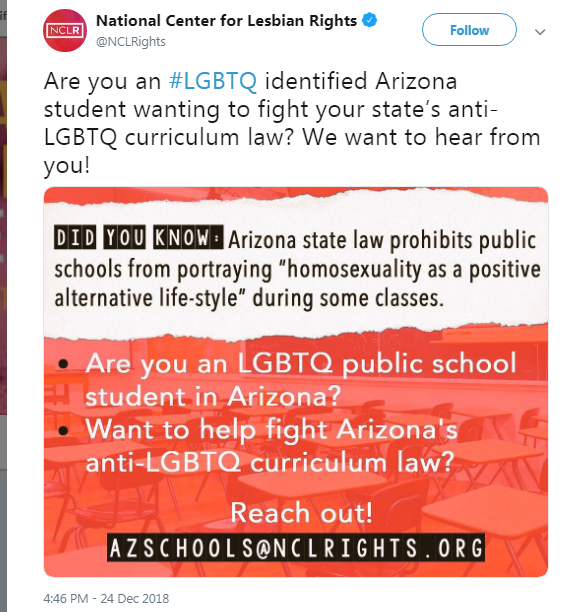 The Federalist did some research, something this generation of K-12 students won’t know how to do because they will be too busy looking over their shoulders in case they say something GLSEN doesn’t think is sexually correct. This article explains who is funding the transgender hysteria and why. Rather than get some help, the perpetrators instead spread lies to trick the general population to join them and normalize their behavior while making big bucks at the same time. According to The Federalist, the Pritzker family has several members who have contributed financially and politically to the transgender movement. Remember when President Obama flipped from supporting marriage between a man and a woman to pushing free-for-all bathrooms in public schools? What changed after he became President? Now let’s tie all of this together. Earlier we mentioned the ACLU and its lawsuit against Great Hearts Academies in Phoenix. If there is an opportunity to make money, Planned Parenthood will be first in line and they will plow through like a hurricane and be unavailable for the clean up afterwards. This is convenient timing–the free 4d ultrasounds at pregnancy centers are cutting into the serial killers’ abortion quotas. Time to diversify. 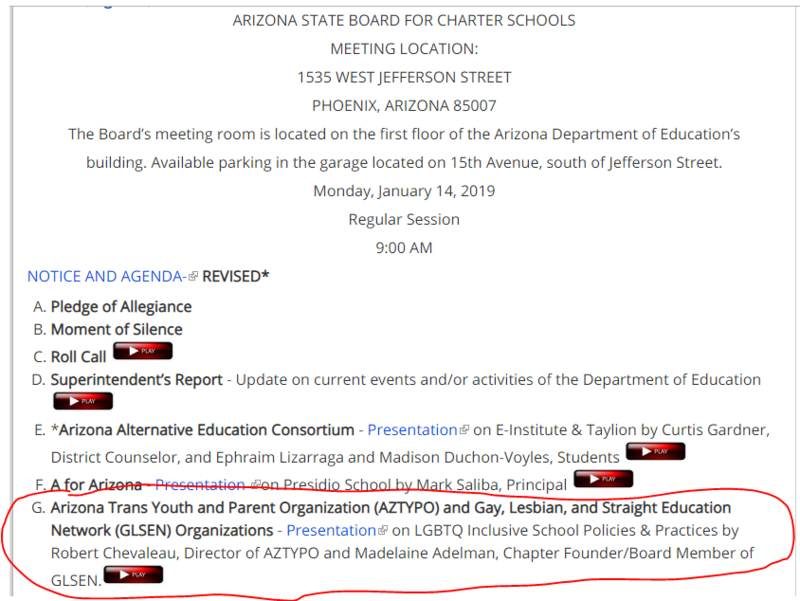 With so much money flowing from the Pritzkers, perhaps Robert Chevaleau could open his own transgender charter school in some state which welcomes those values and ethics. New York State may be just the place to start.